Remember all those nights during your childhood, when you went to bed clutching a sweet, well-loved teddy? 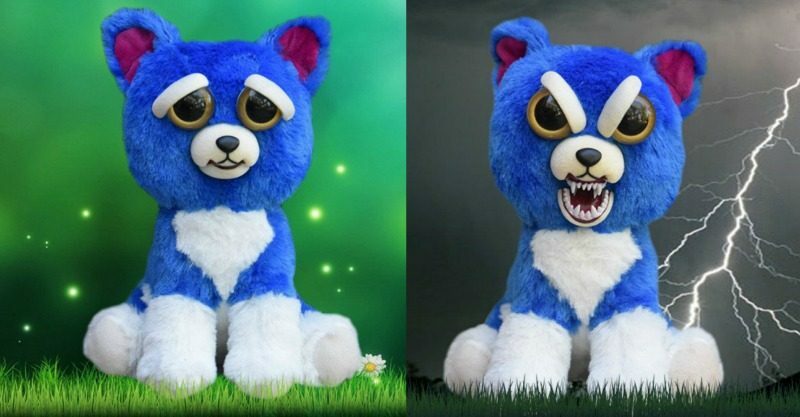 Well, a new toymaker is challenging everything you thought you knew about soft, fluffy toys. It looks like Feisty Pets are the new toy craze (and all around the world, millions of Furbys are sobbing). With just a gentle squeeze behind the ears, these loveable, grinning creatures turn into monsters with evil eyes and bared teeth. The toys come in all shapes and sizes, and have epic names like “Freddy Wreckingball”, “Lady Monstertruck”, “Black Belt Bobby” and “Karl the Snarl”. And when kids get their hands on a Feisty Pet, all hell breaks loose, especially when there’s a zombie Snapchat filter involved. These crazy little critters can even scare the pants off Santa Clause, so if you want to give one for Christmas, make sure they’re wrapped extra tight so they can’t escape! Kids toy advertisements are usually happy-go-lucky, and filled with unicorns and rainbows (so sweet they make you sick!). But these guys make their ads to be the exact opposite. And yes, they are awesome! Warning: don’t buy these if you hate pranks, April Fools jokes or being scared out of your mind 10459 times a day. Have your kids discovered these Feisty Pets yet?